Criticism of Nick Blackwell's trainer Gary Lockett has been "unfair", says ex-world champion Enzo Maccarinelli. 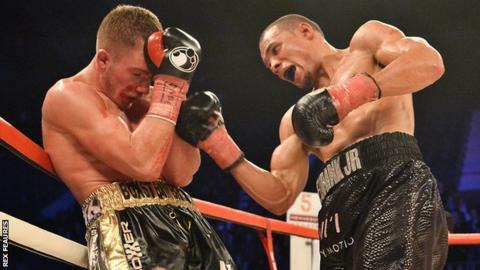 Blackwell, 25, spent nine days in an induced coma after losing his British middleweight title to Chris Eubank Jr in London on 26 March. Maccarinelli, who trains under Lockett and is a stablemate of Blackwell, told BBC Wales Sport: "There's been a load of people trying to point the finger. "I really had to bite my tongue. A lot of it did agitate me." Blackwell, who suffered a bleed on the skull, woke from his coma on Saturday and by Sunday was talking to family and friends at his bedside. The fight at Wembley Arena was halted in the 10th round by the ringside doctor because Blackwell's left eye was swollen shut. Between rounds eight and nine, Chris Eubank Sr - a former world champion - was heard to urge his son to punch Blackwell's body rather than his face. Eubank Sr later said he would pull his son out of a fight if he was in the same situation as Blackwell. Former WBO cruiserweight world champion Maccarinelli, 35, said: "Gary's like a family member. He's a head of our family. I believe he did right and most boxers, most trainers, most managers fall on Gary's side." Maccarinelli also praised referee Victor Loughlin, claiming he was "A-star". He added: "Boxing is the best sport in the world. It just gets annoying sometimes with people having their say, but then you realise they've never stepped in the ring, don't know what it's like." Welshman Maccarinelli revealed the difficulty in trying to remain focused on boxing while Blackwell was in hospital. "From the moment it happened, I've just been feeling sick," he said. "I've been phoning Gary every day for regular updates. The picture I've seen of Nick awake with his brother is just one of the best pictures I've seen." A donation page has been set up for Blackwell, while Maccarinelli's former opponent David Haye will donate 10% of his next purse to Blackwell. "As boxers, we know what every fighter goes through to get in that ring," said Maccarinelli. "It's easy for people to sit in their armchairs and slag people off, never done a day's training in their life or are too afraid to go in the gym. "All the boxers have come together and are trying their best. You see how strong the boxing community is at times like these. Luckily they're very rare. I'm just glad Nick pulled through this. The warrior he is, there was never a doubt."